If you say that Van Morrison is a bore, a grumpy bore even, I am not gonna argue. His vast catalogue of recorded music gives plenty of good reasons to fall asleep. His output during the 80’s and 90’s is a wasteland of snores, the music so slow it stops moving and turnes into a picture that you can hang on the wall. Hard to imagine that this huge, unsmiling sleepwalker with his hats and sunglasses once was a fast moving, red headed fire cracker with a voice that could split the darkness, fronting a scruffy and hardt hitting Belfast-band that gave the Stones a run for their money. They called themselves Them, a short name with an attitude, and they looked just as cool on the cover of their first album as the Stones did on theirs. Them’s wild concerts at Club Rado at the Maritime Hotel in Belfast quickly turned the band into local cult heroes, and by July 1964 they were in London recording for Decca. Their breakthrough came in December that same year when their second single, “Baby Please Don’t Go” / “Gloria” started picking up steam. 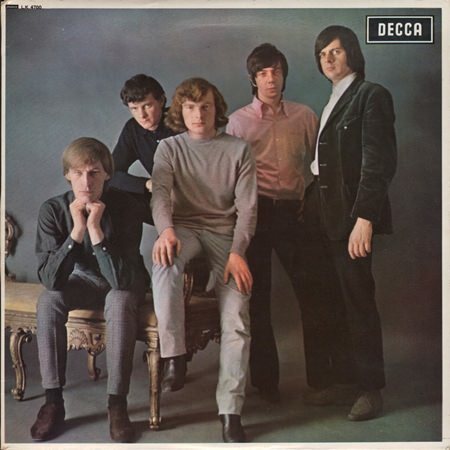 Unfortunately they were not the musketeers from Belfast anymore as Decca kept insisting on using hired hands on their recordings – “Baby Please Don’t Go” got Andy White (drums), Phil Coulter (keyboards) and Jimmy Page (rhythm guitar) on it. And it would get worse. Resulting in numerous line-up changes and mounting to bad feelings. On the second Them-album, “Them Again”, recorded in late ’65, Van Morrison was more or less backed by a bunch of sessions musicians, it didn’t go down well with the actual band of course, and during their U.S.-tour in 1966 Them broke up. Maybe Decca shouldn’t have interfered so blatantly with the band’s recordings. They were a blazing powerhouse on stage, and you can hear traces of that greatness on their first album. Like the two and a half minute snippet of the “Mystic Eyes” that originally started out as a spontaneous and hypnotic instrumental jam, they were seven minutes into it when Van suddenly started singing the lyrics to a song he was working on. Unfortunately Decca decided to cut the instrumental part, so ten minutes of boiling excitement were reduced to two and a half. But even at that, “Mystic Eyes” is awesome. The album also offers the song that would become the ultimate garage band classic, “Gloria”. Them’s live versions of this could last up to 20 minutes, leaving the audience gasping for air. The studio version is tight and infectious, but you wish it would have lasted longer. Other favourite tracks: “I Gave My Love A Diamond”, “Don’t Look Back” and that piece of howling loneliness, sorrow and desperation called “I’m Gonna Dress In Black”. The album is an inspired piece of potent rhythm & blues, electrifying, angry, triumphant and longing. It’s a night record, and it should be played loud. The best tracks match anything the Stones and the Pretty Things were doing at the time. And no contemporay white singer could pour his heart out with more fire and more convincingly than Van Morrison. He even outclassed Eric Burdon.